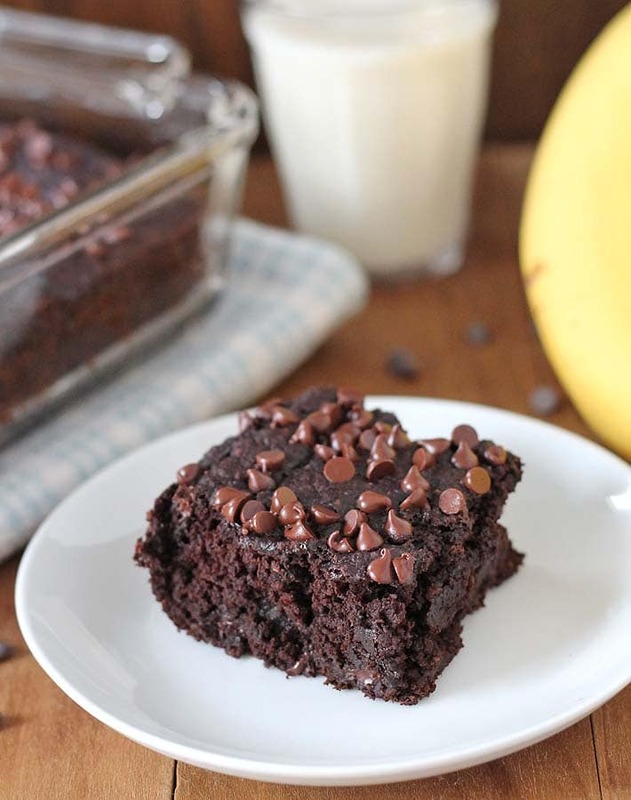 Give in to your deepest chocolate cravings with this rich chocolate banana cake that’s loaded with chocolate chips…inside and out! No one will know this cake is vegan AND gluten-free! You know when you eat a dessert so good that you have to pace yourself because you don’t want it to finish? That’s how I felt the first time I ate this vegan gluten-free chocolate banana cake. It’s vegan and gluten free, but as mentioned above, no one will know! It has no eggs, no butter, no oil, no milk, and tastes amazing. Just further proof that you don’t need those things to make an great-tasting dessert. It took me a few tries to get the recipe just right, but once I got it, it was perfect. 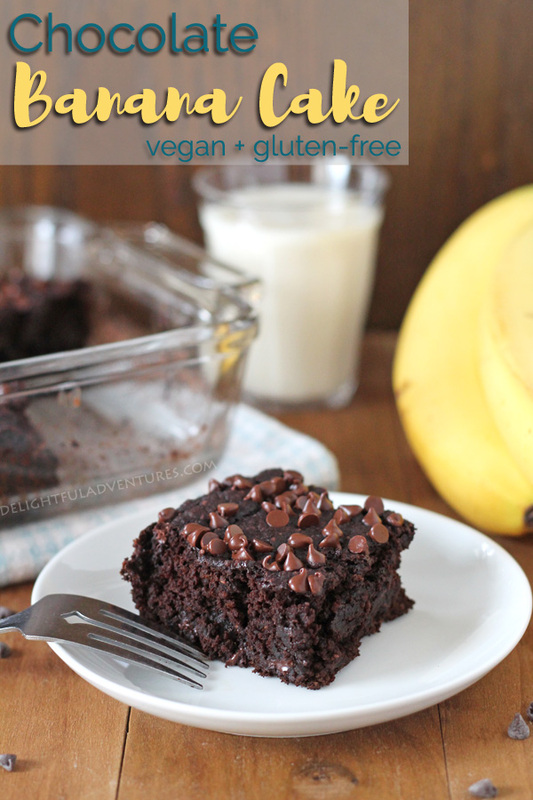 For this recipe, I went back to my vegan gluten-free chocolate banana bread recipe and made a few changes. I wanted to use a different flour, so the first time I made it, I used only oat flour, I knew better, but I wanted to try, anyways. That result was good, but it was way too dense and fudgy, kind of like extremely fudgy brownies. Nothing wrong with that, but that wasn’t what I was going for. What I wanted was…cake! But, a disclaimer: If you’re looking for a fluffy, spongy, light, airy cake, then this isn’t it. What you’re going to get with this recipe is a cake that’s a little fluffy, but at the same time, a little dense and at the same time, a little fudgy. The mix and balance between these three textures is perfect. Part of what contributes to the fudginess is the chocolate chips inside and outside of the cake. Cocoa powder in the cake, chocolate chips in the batter, mini chocolate chips on top? I guess that makes this a triple chocolate banana cake? 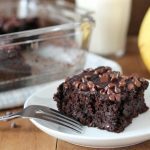 Chocolate banana cake goes perfectly with a cold glass of non-dairy milk, or if you want even more chocolate, hot chocolate! I have not tried with any others, so proceed with caution, but based on experience, I do think that 1 cup of all-purpose flour can replace the oat and brown rice flours, OR you can try with 1 cup of a gluten-free flour blend. Do I have to add chocolate chips? You don’t, but I recommend it for the full triple chocolate effect! If you prefer to not add chocolate chips to the cake, try using walnuts instead or just leave an add-in out all together. As for the mini chocolate chips on top, you don’t have to add those either, omit if you’d like, or top with a nice vegan frosting. Find some vegan frosting recipes to choose from here. If you make this recipe, show me a picture of it. On Instagram, I’m @delightfuladventures. Tag me in your picture and tell me what you think, or, leave a comment below! 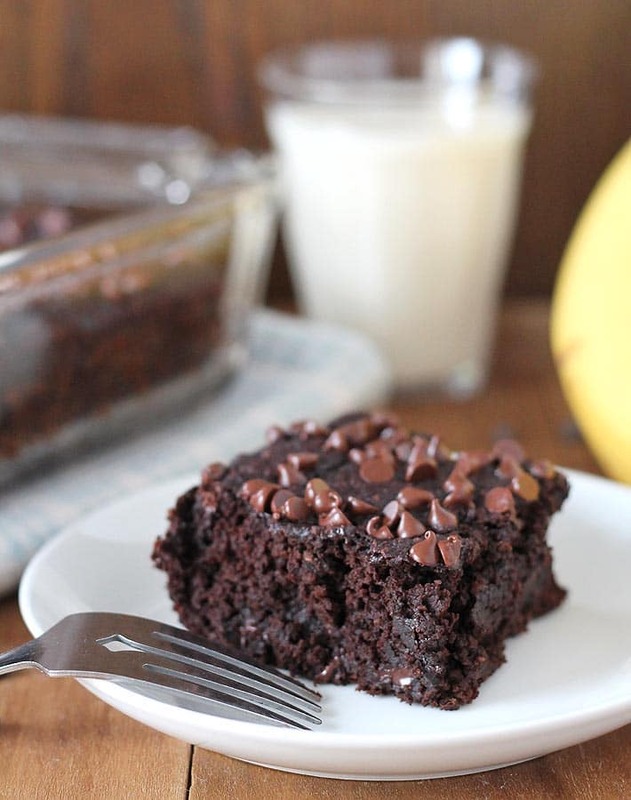 Cure your chocolate cravings with a slice of this triple chocolate banana cake that's both vegan and gluten-free! It comes together quickly, has just a few simple ingredients, and is very easy to make! Preheat oven to 350° degrees F (177 C). Grease an 8" x 8" (2 quart) baking dish or line with parchment paper. 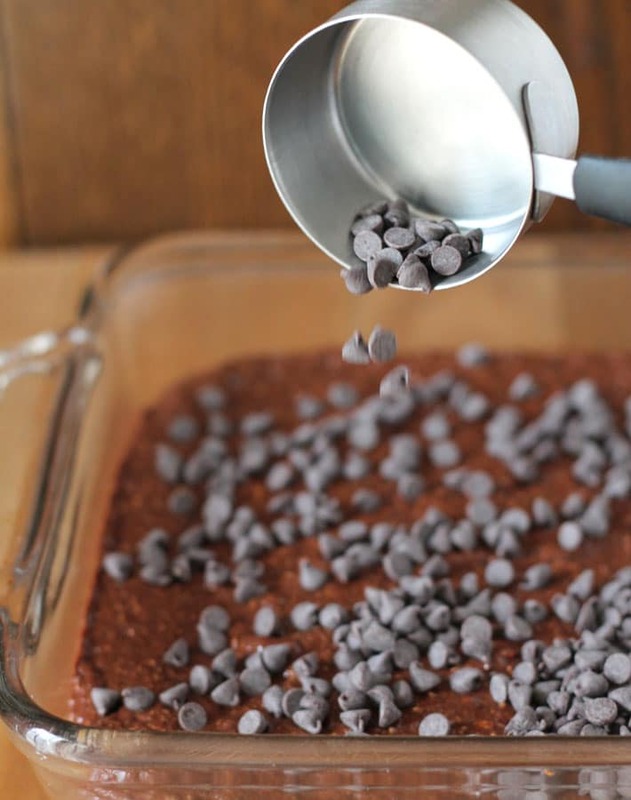 In a large bowl, whisk the oat flour, brown rice flour, cocoa powder, baking powder, baking soda, and salt together. In a small bowl, mix the coconut sugar, unsweetened applesauce, pureed bananas, vanilla, and flax mixture together. 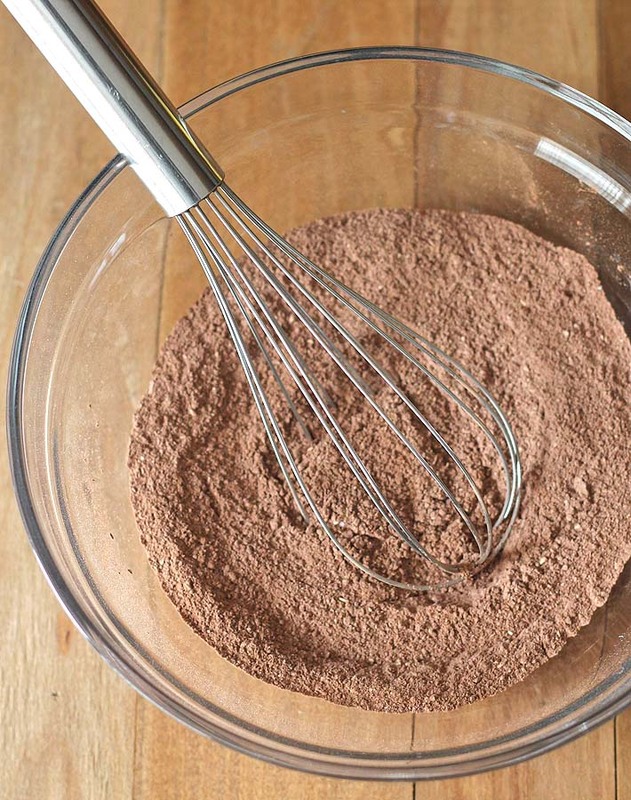 Pour batter into greased baking dish and smooth out the top with a rubber spatula. Sprinkle mini chocolate chips evenly on top of the batter. Bake for 25-30 minutes or until a tester comes out clean. See note. Allow cake to fully cool before slicing. Baking times will vary slightly depending on your oven and the type of bakeware you use. 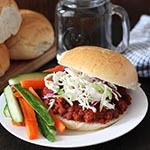 I use a glass loaf dish when making this recipe and it took 25 minutes but can take up to 30 minutes. Start checking around the 25 minute mark and don't over bake. It's important to know that different gluten-free flours all act differently in recipes. I have never used any other flours to make this recipe other than oat and brown rice, so please know that your results may not be the same as mine if ingredients are substituted. 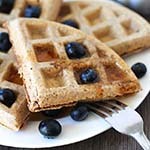 Don't buy oat flour, make your own! It's really easy and so much cheaper. Here's how to make your own oat flour. Brown sugar can be used instead of coconut sugar. Be sure that the cake has fully cooled before cutting or it will crumble. Store leftover cake in an airtight container. Nutrition info is based on the recipe as it is written and on one 1 slice. Nutrition info is only to be used as a rough guide. Click to learn how nutrition info is calculated on this website. Hello 🙂 do you think I could substitute the brown rice flour with arrowroot flour? Thanks! 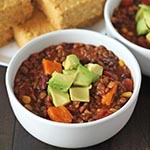 This recipe is delish! For even stronger chocolaty taste, I added 1/2 tsp of instant espresso.. made it super, ultra rich. Hubby pointed out the strong baking soda/ baking powder taste…I thought maybe I read the recipe wrong (1 Tbs baking powder seemed like a lot). Any suggestions on how to get rid of that taste? Don’t want to mess up an otherwise perfect recipe. Thanks for the recipe. It looks gorgeous! I’ll must try this one for the kids. Hi Gwen, thanks for another great gluten free, vegan recipe. I had some very ripe bananas I needed to use and wanted to try a new recipe. Always have great success with your recipes so came to your website first and was pleasantly surprised to find this new banana cake recipe. Made it tonight and we (daughter, granddaughter and I) loved it. I made it exactly as written, no substitutions, although I did whirl the wet ingredients in my Blendtec instead of by hand. Turned out perfect! Thanks so much for creating and sharing your wonderful recipes.